In May, Australian Catholic University made Sr Elizabeth Dodds a Doctor of the University (Honoris Causa) in recognition of her positive impact on countless lives through education and healthcare. 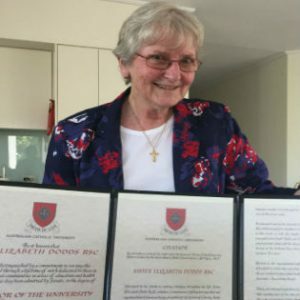 The citation, which was read on the occasion of the conferral of the highest degree the University offers, runs to four pages, and acknowledges two very evident facts about Sr Liz. The first is that her family valued and encouraged learning and set her feet on a path to academia; she has various undergraduate degrees, and also has a Master of Education from the University of Sydney, and a Master of Arts in Leadership from ACU. The second is that she is a perpetual student, with a passion for learning not only in theory but in her very sinew and bone. The Congregation gives her every opportunity to study. The results of these two factors have flourished in service to others – principally in education and for some years in health as either Congregational Leader or a Trustee of Mary Aikenhead Ministries, as well as for the greater good. Early in November, as the jacarandas laced the streets around her home in Sydney’s eastern suburbs, she sat down with KIT to talk about the ACU doctorate, and her continuing ministries. With a glint, Sr Liz told a story against herself … one featuring the professor who tried on several different occasions to persuade her to undertake a Ph D.
“He even flew to Brisbane once to try to talk me into it,” she said. “When I was awarded the ACU Honoris Causa, I had the opportunity to tell him that I got the doctorate, but didn’t have to do the work for it.” Glintier. Just as well. 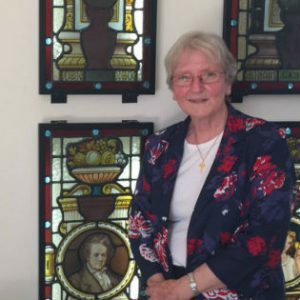 Sr Elizabeth was Congregational Leader of the Sisters of Charity from 2002-2008 and a founding Trustee of Mary Aikenhead Ministries (2009-2011). She is now the Australian representing the Sisters of Charity of Australia in the group selected to Promote the Cause of the Ven. Mary Aikenhead. Her focus these days is mainly in education. Formerly a teacher and principal in secondary Catholic schools in New South Wales and Victoria, and the director of the Edmund Rice Education Directorate in Queensland and the Northern Territory, Sr Liz is also the Australian Catholic Bishops Conference’s nominee as Commissioner of the National Catholic Education Commission (NCEC), where she also serves as chair of the Commission’s Faith Formation and Religious Education Standing Committee. of Charity Gathering in 2018. The conversation doubled back to the ACU degree, and the occasional address Sr Liz gave to graduands at the graduation ceremony during which the university conferred its degrees. Clearly Sr Elizabeth is someone who takes her own advice to heart.